31 1/2 x 25 in. Damien Hirst started his ‘Pharmaceutical’ spot painting series in 1986, when he painted two almost identical arrangements of colored spots on the wall of his warehouse. Today, the spot works are amongst his most widely recognized pieces. This week’s Work of the Week! WOW! is Ala-Met. The name for Ala-Met is derived from two amino acids, Alanine and Methionine, organic compounds that participate in a number of processes such as neurotransmitter transport and biosynthesis. Although created in the deceptively simple polk-dot motif, the work is hypnotic and disorienting, inducing the sort of hazy effects one might get from powerful mind and body altering pharmaceutical substances. 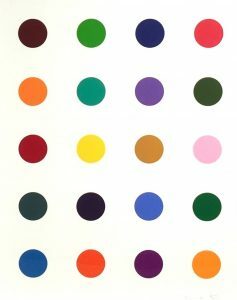 Some colors seem to jump out from the white background, while others recede, highlighting Hirst’s expert control of color. Ala-Met is also faithful to the mechanical and detached appearance of the spot paintings, despite that it is a work created by woodcut. The woodcut is a relief printing technique, in which a block of wood is carved along the woodgrain. This technique typically leaves woodgrain marks on the printed product, whereas Ala-Met achieves a uniform and seamless finish in each spot. Throughout his body of work, Hirst has demonstrated a fascination with mortality. His work calls into question our awareness and convictions about the boundaries that separate desire and fear, life and death, reason and faith, love and hate. Hirst uses the tools and iconography of science and religion, creating works of art whose beauty and intensity offer the viewer insight into art that transcends our familiar understanding of those domains. The spot paintings, with their titles tied to the pharmaceutical industry play on the fact that we have become a drug induced society, yet at the same time these paintings speak volumes about the art itself, as a work of art. Hirst’s work is post expressionism. “I wanted to find a way to use colour in paintings that wasn’t expressionism.” However Hirst does use color and the placement of these colors to express certain ideas or emotions. Each spot painting will have a different meaning or feeling to each viewer coming from different cultures, with a whole different set of life experiences. Damien Hirst has often been a polarizing figure in the art world. His often provokes outrage as well as mystified shrugs. In addition to keeping up with the Warholian tradition of repetitive, consistent images, the spot artworks bring up cultural and contemporary questions. Upon seeing these spot paintings, the lay person will ask “Is that art?” or “That painting cost that much for spots?” This was also said about Warhol’s Campbell’s Soup Can paintings. Time has proven the importance of the Campbell’s Soup Can painting to the art world, as will Hirst’s Spot paintings. This entry was posted in WOW! and tagged AlaMet, art, artgallery, contemporaryart, damienhirst, fineart, gallery, greggshienbaum, greggshienbaumfineart, gsfineart, gsfineartmiami, hirst, miamibeach, minimalism, modernart, mustsee, pop, popart, prints, workoftheweek, WOW, WOW!, wynwood, wynwoodmiami by admin. Bookmark the permalink.